If you don’t live under a rock, then you’ve heard of the #metoo movement. As Time points out, it encourages victims of sexual assault to speak out, to show solidarity with one another, and to demand change. It’s garnered a lot of attention, and has been seen as instrumental in changing social norms about acceptable behavior regarding this issue. Because of #metoo many industries are more aware of their own practices, and how they might leave people vulnerable. One of those industries is the theatre. Navigating the inherent challenges of consent, boundaries, and communication in our industry is not easy, but many are trying. A theatre production requires a lot of things in order to go off without a hitch, both onstage, and off. But the thing it requires most is trust. Everyone is in close proximity, often in the dark. Costume changes can leave performers stripping down in front of other cast and crew members. Helping someone dress, undress, or just get fitted can be a rather intimate situation. And that’s just the backstage stuff! When performers have to rehearse day after day, often portraying everything from passionate desire to out-and-out love scenes, the lines between the play and the people can blur. None of these things are excuses for bad behavior. Rather, because there is so much opportunity for something to go wrong, it’s even more important that everyone is made aware of the situation, and trained how to keep everyone comfortable and feeling safe. If there is a yawning hole in the stage, the first thing someone does is point it out to everyone to let them know about it. Then safety precautions are taken to make sure no one accidentally falls in. Railings are put up. Signs posted. Psychological and emotional dangers are no different. They need to be treated same as physical dangers. But how do you handle incorporeal dangers, when you’re dealing with emotions, thoughts, and feelings instead of physical problems? There are plenty of resources out there. For example, the basics are being taught to children according to The New York Times. And while it might feel a little patronizing, sometimes the basic building blocks are required in order to create a solid foundation. 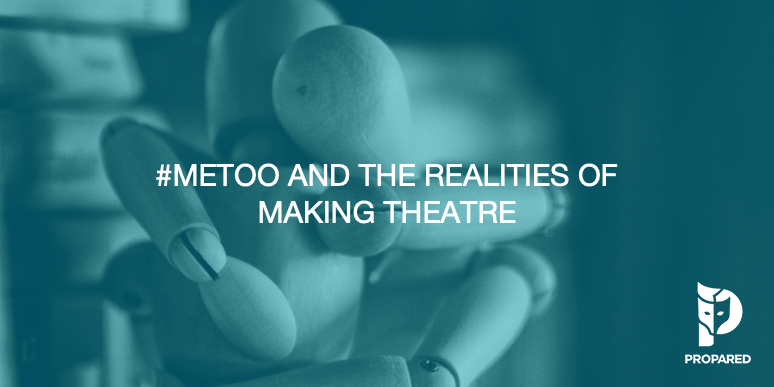 Not only that, but training programs used to help make bartenders more aware of sexual harassment could easily be used by stage managers, directors, and others in positions of authority. There is also the advent of the “Intimacy Director”, a role that works with actors to create intimate, sexual and violent choreography in a way that puts trust, consent and professionalism at the forefront. In film, this role has become more common, and we are beginning to see it move into theatrical and education situations. The Intimacy Directors International organization’s entire purpose is to create safe places for emotionally hazardous work. We need to set expectations and establish protocols for physical contact ahead of time. We need to create an environment where everyone is comfortable verbalizing and communicating. This applies to everyone. Actors should establish comfort zones and boundaries with one another, but those conversations also need to happen with costumers, designers, stage hands, the director, and everyone else who is part of this production. And in addition to talking, we need to listen to be sure that we’re hearing what other people are saying. If you want to make sure that your cast and crew know where the boundaries are, then you have to make sure they’re trained. Safe working environments don’t happen on their own. Checking consent, verbalizing, and respect are not just good ideas, but should be the first reaction to any situation with anyone else bringing the show together. Curious is you need an Intimacy Director? This handy flow chart can help!